HOTLIPS Pizza has six locations in Portland, Oregon, as of May 2016. 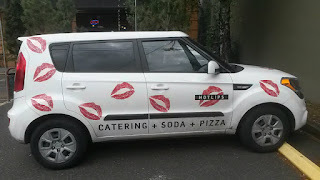 This blog post covers the Hawthorne spot at SE 22nd and Hawthorne. The menu, of course, is mostly pizza. 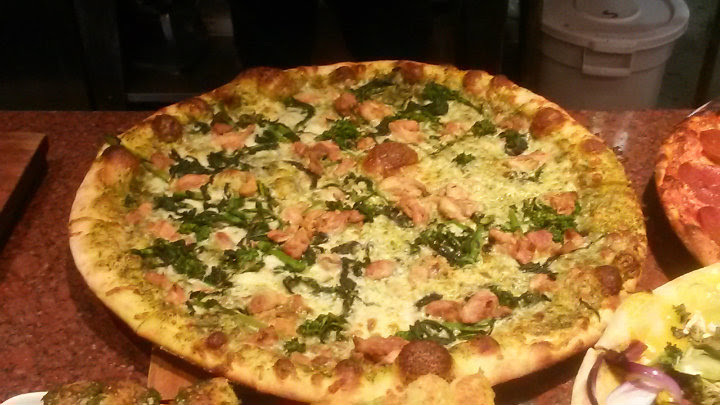 You can get 14" pizzas, 18" pizzas, or the thick-crust pan Sicilian pies. Numerous combinations, as you can create your own. If you're not in a pizza mood, there's salads, sandwiches, and Ruby Jewel ice cream. 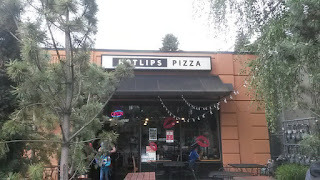 I stopped in during Portland Pizza Week to finally try this place out. Their special slice, "Glazed and Confused," includes tender chicken marinated in HOTLIPS extra-ginger soda, Persephone Farms greens, and mozzarella on a cilantro-pesto base. 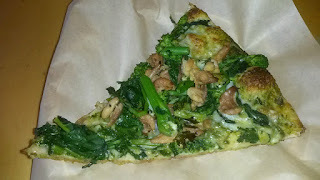 Very good service here; I got my slice within a minute. 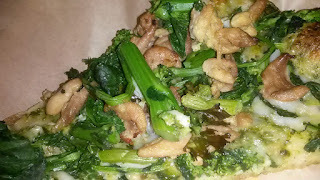 Generous layers of greens and a good amount of chicken here. Excellent crust, with a nice crunch. 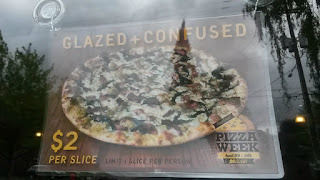 With all the toppings, I probably didn't get the pesto as much as I would have liked. Still, a very solid pizza. 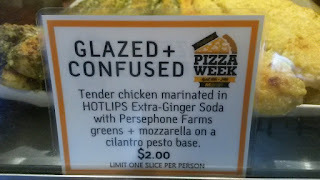 With all Portland Pizza Week slices going for $2, this was quite the steal. HOTLIPS Pizza is known in the area for making pizzas and making their own sodas, but to my surprise and delight, they also make their own hot sauces. 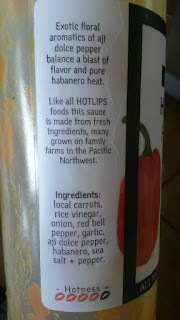 Their carrot-habanero sauce has decent kick and wonderful flavor. 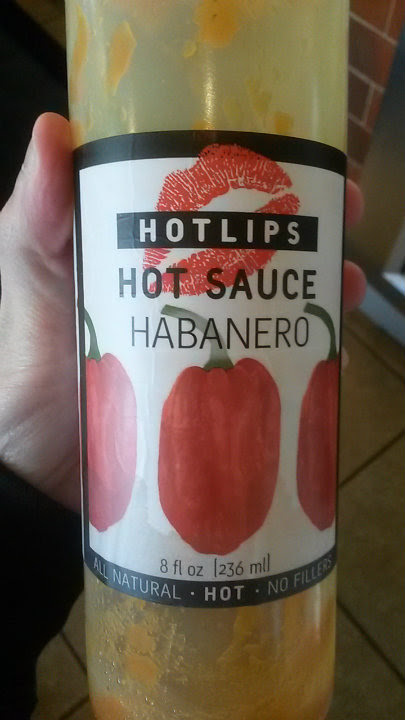 It's a must-try if you like anything spicy. 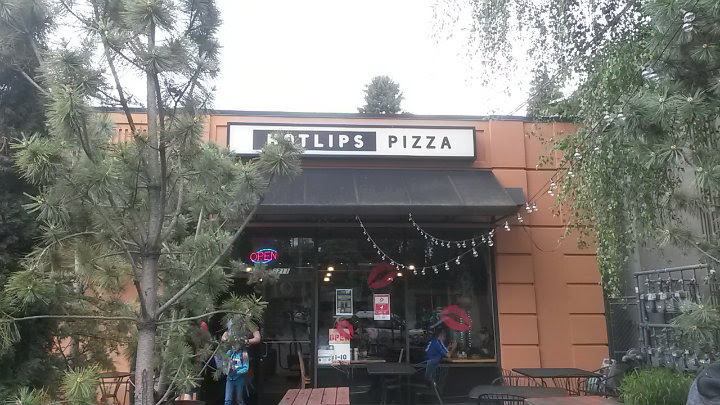 There's a small parking lot right in front of the Hawthorne location, but spots tend to fill up quickly during peak hours, so I'd generally suggest parking on one of the side streets in the neighborhood.